tenHsDesktop, running as a stand-alone program on any networked computer, connects to your HomeSeer server and displays the real-time status of selected Devices in a small, easily customized display panel. You can control HomeSeer Devices and run HomeSeer Events as well as monitor the HomeSeer log. The primary design criteria is to supply as much information about your home's status in a minimal amount of space. 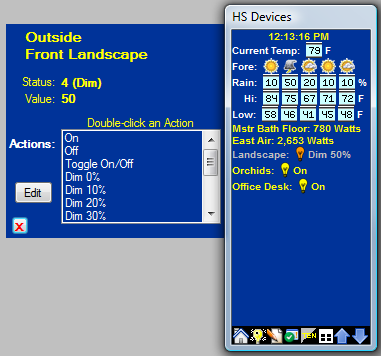 You normally configure the display panel to show only Devices that contain pertinent data or images (such as weather devices) and devices that are in a state that you want to be aware of (an open door, lights left on). 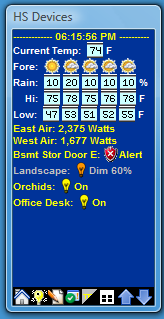 The sample below displays the information from several plugin devices that show weather information, that two air conditioners are running and their energy use, that a basement door has been left open, and that several lights are on. You can double-click any of the Actions defined for the Device, and the action will be sent to HomeSeer and the display panel will be updated to reflect the Device's change in status as soon as it is notified by HomeSeer (usually immediately). Double-click on an Event and it will be run by HomeSeer. Select a Location and Device and then double-click an Action for that device. Runs on any computer -- connects to your HomeSeer server either across your local network or across the internet. Updates Device status in real-time. You can define when a device is displayed (based upon device status or value) and how it is displayed, incorporating a device's Status, Value, DeviceString text, one or more DeviceString icons and literals. Displays the HomeSeer log. You can specify search criteria to highlight matching records in the HS log, and you can be alerted when HomeSeer writes a log record that matches the search criteria. 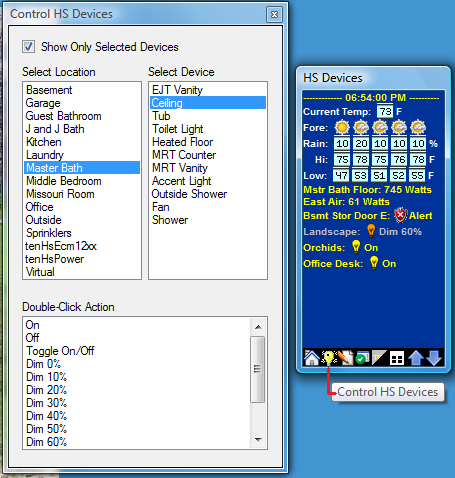 Control any HomeSeer device from your desktop. You can specify which devices will trigger an alert when it's Status, Value, or DeviceString changes. 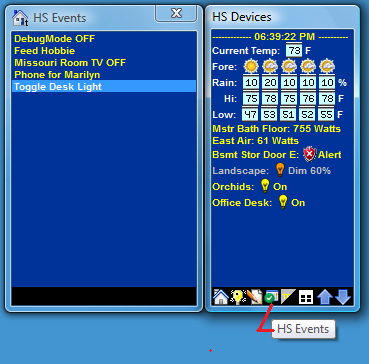 You can specify HS Events to be triggered when your desktop's screensaver starts and stops. For instance, you can have tenHsDesktop turn off your office lights when the computer's screensaver starts. You can specify a list of links (URLs) that when selected will open a web browser and display the link page. You can set links to the HomeSeer status page, a web page for control of your sprinklers, a graph of your current energy usage, etc. Create multiple Profiles containing all program options and device display settings. This is useful for when a laptop is used in multiple environments requiring different definitions (even connecting to different HomeSeer servers).